Fishing, cross-country skiing, canoeing, camping, hiking, and wildlife viewing are just some of the outdoor pursuits that can all be enjoyed in Bearhole Lake Provincial Park and Protected Area. The area teems with wildlife. Watch moose wade through the marsh and lake shallows or observe beaver busily chewing bark off of willow or aspen twigs. Bird enthusiasts will enjoy seeing nesting trumpeter swans or listening to many of the warblers found in and around the area. Whatever you choose, this clear water lake definitely has a lot to offer. Trumpeter swans are easily disturbed during the nesting period. Please do not approach these elegant birds or their young during this critical time. group sites) must be reserved through Discover Camping. Explore Parks: Fees, park listings, what you should know before you go and other useful links. 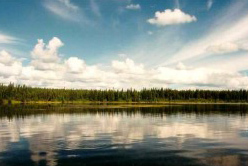 Bearhole Lake Provincial Park and Protected Area is located 25 km east of Tumbler Ridge on the Alberta Plateau. Access is via 20 km west along the Kiskatinaw Forest Service Road You can access the Forestry Road from the Heritage Highway. Please note: The Forestry Road is not usually maintained and becomes rutted and slippery after rains. Caution advised. Cultural Heritage - Area of traditional use by First Nations of the Treaty 8 Tribal Association. Conservation - Trumpeter swans find critical nesting habitat in and around Bearhole Lake. The area surrounding the lake contains undisturbed boreal white and black spruce forests and wetlands typical of the Kiskatinaw Plateau ecosection. The headwaters of the Kiskatinaw River are within the boundaries of the park and protected area. Low elevation caribou, moose and white-tailed deer find important winter range within the park and protected area. Wildlife (specific to this park or area) - The lake contains yellow perch, burbot, rainbow trout, northern pike, large-scale sucker, and white sucker. Trumpeter swans use the lake and surrounding marsh to nest and fledge their young. Moose, caribou, black bear, white-tailed deer and numerous small mammals and birds all reside in the park and protected area. There are no online planning documents available for this park and protected area. Bicycling is permitted in the park. Helmets are mandatory in British Columbia. There are no developed trails at this park but visitors can explore the area. Always be prepared when venturing out in the backcountry/wilderness area. The park is open to hunting. All hunters to the area should refer to the current BC Hunting & Trapping Regulations Synopsis for more information. . There are swimming opportunities in the park. There are snowshoeing and backcountry skiing opportunities in the park. There is a boat launch in the park. Campfires are permitted. To preserve vegetation and ground cover, please don't gather firewood from the area around your campsite or elsewhere in the park. Dead wood is an important habitat element for many plants and animals and it adds organic matter to the soil. You can conserve firewood and air quality by keeping your campfire small. Limited burning hours or campfire bans may be implemented and some parks may use communal fire rings. Be prepared to bring a portable stove for cooking. There is a day-use area and picnic facilities in the park. There are pit toilets in this park. There are vehicle accessible camping facilities at this park.